It’s been a busy week or so here at Calder Security. 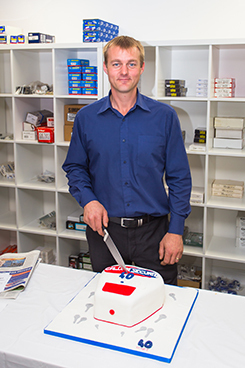 We moved into our new premises on 4th July and we held our open day on 9th July to celebrate the move and our 40th anniversary. The event was really well attended, despite the torrential rain, and we cut over 100 keys that day on our key cutting for £1 offer. Some customers even came from as far as Yeadon in North Leeds to see the new shop and a few popped in on their way from or to the local Ossett Gala that was also on that day (possibly to get out of the rain!). We had cake, balloons and bucks fizz and we also gave out discount vouchers for burglar alarm services so it was well worth coming along! It’s now back to business as usual here in our new home – lots of servicing, installations and lock jobs on our books plus of course, serving customers who come into the shop for key cutting and to buy locks and safes. If you didn’t get chance to come on Saturday, please do feel free to come down to the shop. We’re open Monday to Friday 8.30-5.00 and open to the public as well as trade customers. You don’t need to make an appointment and you don’t need an account. We have parking right outside and, if you ever came to the old shop on Calder Vale Road, you will see that we offer a much bigger range than previously due to the extra space we now have. See our contact page for directions.